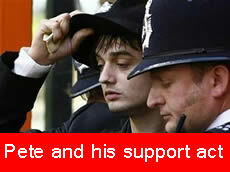 PETE Doherty’s Court Out tour continues to get great press. And the Sun brings news that Pete has added an exciting new twist to his act. In “Burgling Doherty burgled”, the Sun says that Doherty’s home has been broken into and thieves have made off with a guitar and some of his paintings. Of course, if the crooks are caught – and an alert has been put out to all hospitals – . Doherty may well be removed from his traditional spot in the dock and relocated in the witness box. Who will then dare to say his act is tired?